Got a kiddo? Get him/her this book. Yesterday I shared a few books I was probably too young to read. It only feels appropriate that today I'm writing about a book that was not at all written for my age group (though, I have to admit, being a twenty-something sometimes feels as confusing as being a teenager). After an awesome buddy read of Ursula K. Le Guin's The Lathe of Heaven with Julianne, I wanted to try out another of the feminist sci-fi writer's works. The Left Hand of Darkness has come recommended more than a few times, but I ended up checking out A Wizard of Earthsea, the first in Le Guin's young adult fantasy quartet about a young wizard named Ged. I gulped it down in under 24 hours, and my first thought upon finishing it was that my children will have this book on their shelves (or, more likely, the chips implanted in their brains). I don't even want kids. At this point in my life (and maybe forever), I'd much prefer to read this to my cat. Even so, I couldn't shake the feeling of wanting to shove a copy of it into the hands of every 8- to 13-year-old I see (but not on my Kindle, do you know how grubby kids' hands are? I do; I work with them. Sorry to any children who read this blog). 2. Self-acceptance wins the day here. In Earthsea, everyone has their "true name" (one they should keep to themselves and only share with those who will not exploit it) and their "use name" (the name they go by in daily life). This was a great metaphor for a few different ideas: recognizing that you mean different things to different people, that it's perfectly acceptable (even good!) to establish personal boundaries with others, and that you are the only one who can know yourself best. Sometimes I think that self-knowledge and personal growth get muddled in with romance/finding the "one person who really gets you" in YA. There wasn't a single drop of romance in this novel, and it really opened the door for Ged to, in Le Guin's words, "learn to be Ged." I want my hypothetical kids to do their best to know themselves before trying to know (and please) anyone else. 3. This book is chock full of people of color. Most of the citizens of Earthsea we meet in this book have dark complexions, and Le Guin challenges racist stereotypes by inverting them. For example, the Kargish men who raid Ged's village at the start of the story are explicitly described as having "white faces." Obviously, reversing the black vs. white dichotomy isn't doing a whole lot to destroy the "us vs. them" dichotomy itself, but it was still super refreshing, especially for a book published in 1968. I'm reminded of Chimamanda Ngozi Adichie's TED talk about "the danger of a single story." I think the younger we can introduce diverse narratives, the better. 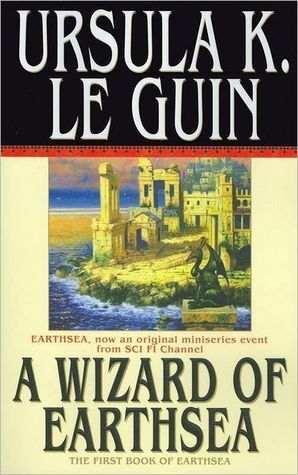 If you haven't read A Wizard of Earthsea, take a few hours to do so. It's available for free through the Kindle Lending Library. I'm off to fan-girl over Ursula K. Le Guin and build a bookshelf for my cat. Fur babies need education, too. Yes! All the love for this series. I don't have (or want) kids either, but luckily work does give me the chance to put it in the hands of many 8-13-year-olds :D Have you read Le Guin's Annals of the Western Shore? I think I love it as much as Earthsea, possibly more (gasp). URSULA IS A GODDESS. Love this. When I'm back in Minnesota next I'll grab this and bring it to Chicago. Did you like it more than Lathe of Heaven? I really, really need to read something by this author! Yes, do! It's such a lovely little book, and short to boot. But he must! Cats need to learn to go to school and pull their own weight. They can't nap ALL day. And I haven't! There are oodles of Le Guin novels/series I hope to get to soon. I think next on the list is going to be The Left Hand of Darkness. I actually did, but it's hard to compare the two. Lathe was clearly written for adults whereas the Earthsea series is meant for kids/pre-teens. I want to read some more of her adult work to see if I find something in that realm that measures up to Earthsea. Hehe, I'm glad! This was such a good read for me. And I've still got my eye out for a copy of The Left Hand of Darkness.